Step inside one of Mike Caro’s best poker seminars and learn the secrets that serious players and pros need to demolish opponents. This hour-long DVD was filmed live at Hollywood Park Casino in Inglewood, California (Los Angeles area) in 1998. Multiple cameras cover the fast and furious action as Caro teaches one big-money tip after another. This video can stand by itself or be a perfect companion to the Caro’s Power Poker Seminar DVD (also available in the Poker1 store), which covers many of these concepts with different emphasis in a separate presentation. (Get both to reinforce these powerful, proven, winning concepts.) As a bonus, exclusive Mike Caro one-on-one training filmed after the seminar enhances the intense public presentation. One of Mike Caro’s finest moments, filmed before a live audience of serious poker players. Betting advice, hands to fold, manipulating opponents, tells, maintaining a bankroll, the science of poker, the most profitable tactics, and much more — a complete poker learning experience. Put the odds on your side and enter your next poker game with a huge advantage. Secrets discovered during decades of Mike Caro poker analysis and research are openly shared. Learn how to take these powerful tools straight to the poker table — and then to the bank! Let Mike Caro personally arm you with the right winning attitude and never again let your emotions damage your bankroll. In one dynamic hour, Mike Caro can make you the force to be reckoned with at your table! Even if you never get to a casino to watch Mike Caro perform his poker training live, here is almost the same opportunity. 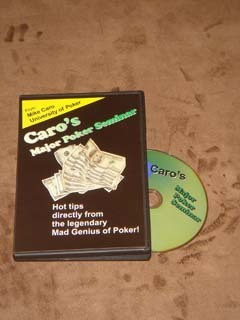 This major poker seminar, complete with exclusive, additional Mike Caro training, is all captured on one astonishing DVD.